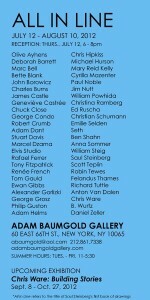 Rob Tewes, an artist and Jill Anderson customer, will be having her artwork exhibited at the “All In Line” opening at the Adam Baumgold Gallery in NYC on July 12th, 2012. Go out and support a Jill Anderson customer! This entry was posted in jill's customers. Bookmark the permalink.